Rabbi Shmuel Bloom (!) attacking my friend Barry. Gratuitous anecdotes, ad hominem innuendo and no substance. You would think Barry is the sitra achra! In reality, if the Ginzbergs and the Blooms of the world have no more cogent and coherent responses for an oved and mevakesh and a tamim like Barry than to taunt, insult and belittle him, then Charedi Orthodoxy is in deeper trouble than one would have imagined in one's most negative moments! Hashkafa Issues: Helping Students Engage with the 4 Questions: "Where did we come from? Why are we here? What is our purpose here? Where are we going? A session at a Yom Iyun devoted to topics that should be issues for yeshiva high school students. "Where did we come from? Why are we here? What is our purpose here? Where are we going?" 1. Why believe in G-d? 2. Why believe in Torah Mi'Sinai? 3. What is Nevu'ah and what was unique about the nevu'ah of Moshe Rabbeinu? 4. Is there and what is Hashgachah Pratis? 6. To what extent does free will exist? 7. Why are the decrees of Chazal binding? 8. Are the Rambam's Ikkarim subject to dispute? 1. How do we deal with the Age of the Universe? 2. How do we deal with Evolution? 3. How do we deal with discrepancies between Jewish and secular chronologies? 1. What is “Good?” Why is Judaism “good?” Why is Judaism good for me now? 2. What is “Idealism” and how is it achieved? 3. What is “Happiness” and how is it achieved? 5. How can we make Tefillah meaningful? 6. What is Torah Lishmah? 7. How do we define Tikkun Olam? 8. What are appropriate motivations for being Machmir vs. being Meikel and vice versa? 9. What is the problem with Nivul Peh? 1. Why is Negiah forbidden? 2. Why is self-pleasuring frowned upon? 3. Why are teenage boy-girl relationships questionable? 4. Why is homosexuality forbidden? What is the status of homophobia? 5. Are women inferior to men, or vice-versa? 6. What is our stance on co-education? 1. Why to learn Gemara? 2. Why to not learn Gemara? 3. Should boys and girls have different curricula? 4. What are the various attitudes towards secular studies? 1. What is Zionism? What is Religious Zionism? Is there Religious non-Zionism? 2. What was the Satmer Rebbe's position and how does one respond to it? 3. 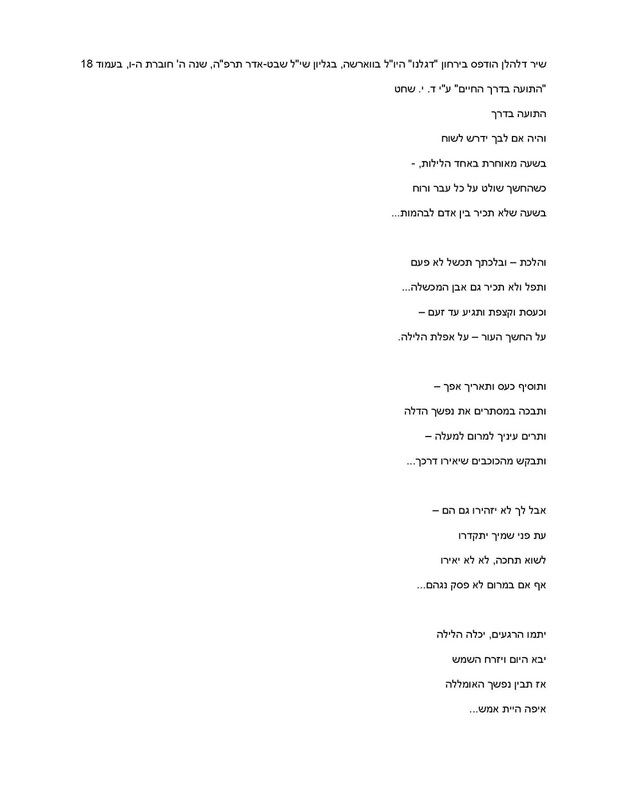 Why are there various different approaches in regards to reciting Hallel on Yom Ha'Atzma'ut? 1. What should be our attitude in regards to secular music? 2. What should be our attitude in regards to other secular entertainment? 3. What should be our attitude in regards to sports – participatory and spectator? 4. What are the various approaches on insularity? 5. What are the differences between Torah-Only, Torah-im-Derech-Eretz and Torah U'Madda? 1. Why do some men wear black hats and jackets and some not? 2. Why are there various standards in regards to Tzeniyus for women? And men? 3. What is Modern Orthodoxy and what is Charedism? 4. What is Da'as Torah and how should we relate to it? 5. Why do some people have problems with Chabad-Lubavitch? 1. What happens to the Neshamah after death? 2. What judgment takes place? 3. Is there a Heaven and is there a Hell and what are they? 4. What do we believe concerning Gilgulim? 5. What happens at Techiyas HaMeisim? When does it take place? 6. What is the role of Mashiach and what happens during Yemos HaMashiach? 7. When and what is Olam HaBa? I am grateful to Rabbi Bender for his infinite chassadim to my family in numerous areas. Any comments I make are in no way intended to minimize the tremendous feelings of respect I have for him. Similarly, I had the opportunity to know the father of Rabbi Ginzberg from my days in yeshiva. He was a paragon of seiver panim yafos, friendship, kindness, and concern about the welfare of all the bachurim. Any points I raise here are only intended as an exchange of ideas and an expression of deep pain for what I and many others see in the current state of affairs. I was inspired to devote a number of years to learning in my early youth. The warm feelings towards Torah, Yiddishkeit, and a Shabbos table filled with ruach will never be dimmed. The desire to maximize that path motivated me to send my kids to chareidi yeshivos where they were given a warm and meaningful Torah education. However, I am deeply disturbed at what has been happening on a wider level in the klal as a whole. I believe I speak for many others, and I know my chaverim have discussed these issues with me, as well. 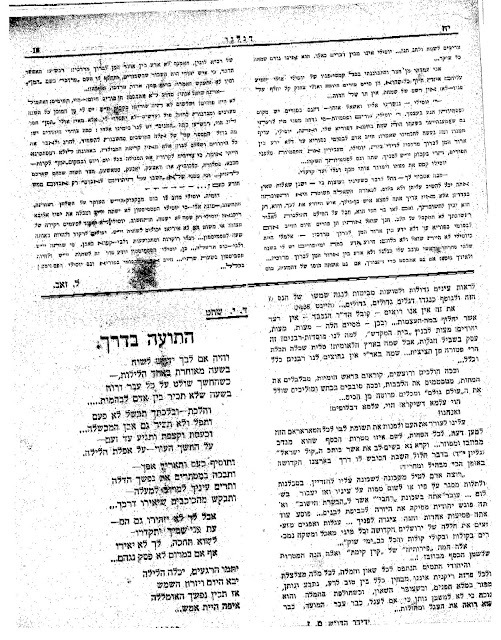 In 1923, the Moetzes Gedolei HaTorah passed a resolution condemning the efforts of the Zionists and vowed to fight any attempt to set up a state with all means at their disposal. This was 25 years before the saga of the Yemenite children whose peyos were allegedly cut off. This fighting and denigration of the medinah continues until this day. Chareidim refuse to say the tefillah for the medinah or for the chayalim in their shuls, citing all kinds of Kaballistic reasons, or because we don’t have power to write new tefillos (despite that we say new kinnos on Tishah B’Av for the Shoah) or other creative points. 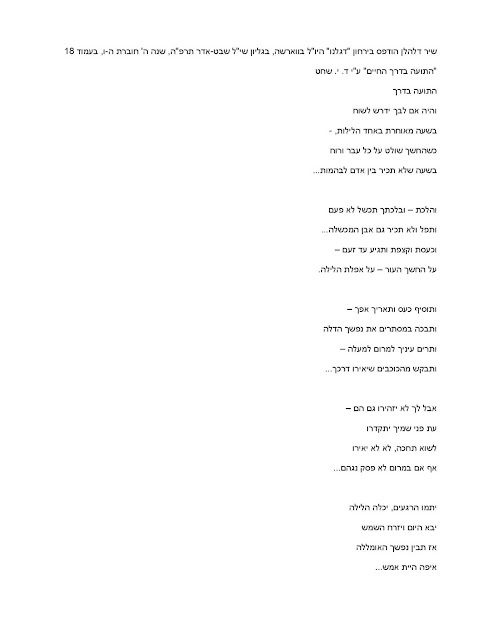 However, in the old siddur Otzar HaTefilos, written about 100 years ago, there is a tefillah for Czar Nikolai, his wife, his parents, and children, mentioning them all by name, with effusive praise for each. We are allowed to say a tefillah for this individual who was no friend of the Jews, but for our brethren in the Israeli government, it would somehow ruin the davening. The average Jew is tired of this stuff already. When a Jew goes to Israel and is greeted at the airport by the sign, Bruchim Habaim L’eretz Yisrael, his heart soars. When he enters Yerushalayim and sees the beautiful floral arrangement spelling out Bruchim Habaim LiYerushalayim, and sees the Old City and the Kotel, his heart is torn with emotion. When he sees young soldiers guarding the streets with dangerous weapons, the same age as our kids, who are often roaming the pizza shops, he is amazed at the level of responsibility and maturity they have achieved at such a young age. When he sees how advanced the country has become technologically, such that it exports its know-how all over the world, in areas such as military technology, water management, agriculture, medicine, electronics, software, and nanotechnology, his heart bursts with pride. When he realizes that there is freedom to set up as many shuls and yeshivos as he pleases, without any fear of pogroms or anti-Semitism, he is overjoyed and dumbfounded that for the first time in 2,000 years, this is possible. Medinas Yisrael is the biggest berachah the Jews have received since the destruction of the Beis Hamikdash. A little while ago, there was a picture on the front page of the 5TJT of a young child hugging his father’s grave at the military cemetery. The father died so we can enjoy the freedom and the shuls, yeshivos, and mekomos hakedoshim of Eretz Yisrael that we now have. Can chareidim not give this poor child respect for two minutes and stand still while he cries? How dare any leader not emphasize basic decency in his yeshiva. When a frum IDF soldier is stoned and rained with trash when he enters Meah Shearim, the rest of the country is sickened. We often hear that it is one meshugeneh. Totally wrong. When verbal violence is preached at the top levels, physical violence results at the lower levels. All the chesed that the chareidim do, while certainly well appreciated (as it is here in the Five Towns, as well), it doesn’t come to a drop in the ocean of the chesed that the Medinah does. The chareidim may provide transportation, food, or advice to people in need of medical treatment. But who provides the hospitals, medical training, medicines, instruments, research, universities where training and innovation is carried out, and roads to transport the patients and medicines, etc. They also pay for the care, to begin with. Another rav Rabbi Ginzberg is fond of quoting spewed forth the same type of anti-Zionist vitriol for years. One can open up a book of his transcribed speeches in English. This same rav also founded new political parties. One would think some important ideology was at stake. But it was his dislike of a certain rebbe. For some unknown reason, despite this rebbe’s incredible erudition, breadth, and kindness to all segments, this rav considered the rebbe to be inferior to himself. He disliked that rebbe so much that when that rebbe’s wife passed away, he told other rabbanim not to pay a shivah call. The klal is mortified and tired of this. These types of things have led to a weakening of faith in daas Torah. Is it telling that the preceding two-brother chassidic movement, and the preceding rav’s yeshiva are now both torn asunder by internal machlokes? Walls have had to be built and smoke bombs have been thrown in the beis medrash of one of the world’s most prestigious yeshivas in Israel. Midah kneged midah? Perhaps. But maybe just the natural progression of things. When multiple generations have been raised on hatred and sinas chinam, the imbibed hatred is then used on each other, as well. A few years ago, there was a major chinuch protest demonstration, with all chareidim in Israel urging their followers to attend. What was the issue? The Israeli government was upset that a certain school was separating the Sephardic girls from the Ashkenazic girls by means of a fence in the middle of the school building, and down the middle of the playground. Personally, even if a thousand gedolim held a demonstration with a million followers urging people to be cruel to young Sephardic girls, I would follow my heart and simply ignore it, and instead welcome them with open arms. The hamon am is disgusted. One of the speakers mentioned that we are experiencing a war against Torah Judaism, an oft-heard refrain of the last hundred years, that the chilonim and Zionists are aiming to destroy Torah and see the chareidim as its symbol. This is needlessly inflammatory (but admittedly effective as a way to rally the troops) and simply false. Reb Aryeh Levine dressed chareidi. Yet the Knesset dedicated a special day in his honor and made a special plaque which was awarded to him in a major presentation. He worked with all his might to help the fighters in the early days before the state. After davening, he walked tens of miles on Shabbos to the prisoners in jail to tell the families how their loved ones were doing. He cried out on Rosh Hashanah, mentioning each by name, when they were sentenced to the gallows. The chilonim recognized that he loved them with all of his pure heart. The chilonim, in turn, loved him with all of theirs. If we acted like Reb Aryeh, and gave the chilonim the slightest bit of hakaras hatov and warmth and appreciation for the amazing achievement they accomplished (bsiyata deshmaya), not just as a condescending ruse to be mekarev them, but with a sincere and full understanding of the miracle they created and the intense effort they put in; and if we offered to move our yeshivos to the army bases to keep them company in times of war and be mechazek them with kindness; and if we stopped our foolish and angry (and baseless) rhetoric, they would never think of drafting a single yeshiva bachur. We have only ourselves to blame for this miserable situation. Let us try to rectify it before things get worse. With gratitude to Hashem Yisborach we would like to let you know that our son Yitzchok Elimelech has become engaged to Nechama Cypora, daughter of Rabbi & Mrs. Zvi and Menucha Silver of Flatbush. A vort will take place this Wednesday June 19, 7:30 - 10:30 p.m. at Yeshiva Ketana Hall, 911 East 13th Street. We would be thrilled if you could participate in the simcha, but we appreciate the arduous qualities of the trek to Brooklyn for those farther away, so please do not feel any obligation! P.S. I think RAEK's influence is obvious!